SPOKANE, WA � Decision-making in American government and other institutions in the 21st century is likely to become more authoritarian and will drift away from the democratic ideals of the Enlightenment, one of the nation�s best-known libertarian First Amendment scholars is warning in a new book. In the name of the poor and downtrodden, the exploited environment, the impulse to egalitarianism, and the need for a common health care and education, the state controllers will join forces to centralize power in their hands. As citizens become more individually impotent, turning for their every need to the central force, social order will be assured. Authoritarianism is seductive, with a beguiling quality, a disciplined aura, a lure for orderly minds who want structure and social engineering, and a sense of security and institutional stability. Plato even made it seem desirable and rational. It is a potent socio-political magnet that pulls unceasingly at nations and people � and also at journalism. It implies authority and mass-man wants leadership. In many countries even journalists, among the society�s "intellectuals," feel comfortable having strong hands at the editorial helm. They, like so many people, are somewhat uneasy with freedom and desire "to escape" from it. Merrill, who was professor of journalism at the University of Missouri before retiring from teaching in 2004, is author of more than 30 books. In Call to Order, he summarizes Plato�s ideas about social control, which emphasized a benevolent but authoritarian system, and then briefly traces Plato�s legacy, covering all major thinkers up to the present. The lure of authority always brings out the arbiters, those who see themselves as the order-givers, the knowledgeable, the leaders, the dictators of correctness for an institution, the state, or society. In the U.S., as World War II ended, these arbiters of correct ("responsible") journalism began to rush onto the stage to denigrate Enlightenment liberalism and to set standards for journalism and communication. They questioned the value of individual freedom. This din of "progressive" and "authoritative" voices of the intellectual elite has spread throughout our educational and public life in spite of continued talk of "democracy" and the postmodern inclination to relativism. A new call was going out � a call for Order. A need was seen for more authoritative norms, for more conformity, for more discipline � in short for more responsibility. This was a definite shift in emphasis. During the early part of the 20th century emphasis had been given (at least in the West) to pluralism and press freedom. In societies mainly emanating from the European Enlightenment of the 18th century, a free and independent press was thought important�even essential � to public welfare. Free expression was emphasized. But at mid-century doubts about the importance of freedom and individualism sprang up and critics began to point out that these Enlightenment values had not worked and were leading to an unruly society and communication system. It appeared that it was time for a paradigm shift � and it was a substantial one: from freedom to responsibility, from disorder to order, from individualism to groupism. Merrill is particularly concerned about the rise of neo-Marxist theories, postmodernism, and the communitarianism and public journalism movements. "They have not directly condemned freedom, but in very subtle ways have proposed limiting the power of the media managers and putting it in the hands of the citizens or in government agencies. The assumption here is that some extra-press authority would be more responsible managers than are the current directors, publishers, and editors. Communitarianism today is trying to reestablish community and values, to put the society above egoistic individualism, and to stress social obligation rather than an obsession with personal freedom. The collectivity in a sense becomes the authority � a kind of democratic authoritarianism. Does this mean that the "community" has some sort of authority? It seems so, but its nature is amorphous. At any rate, individualism must be lost or subsumed in the community. Merrill believes that, in terms of information, there are still some "optimistic signs." He says newspapers like The New York Times, Switzerland�s Neue Zuercher Zeitung, Spain�s El Pais, France�s Le Monde, England�s The Independent and Mexico�s La Reforma will continue to improve and provide credible information. However, the long-term prospects for libertarian ideas of freedom and individuality are not promising. Plato�s society is a kind of a heaven on earth. Everybody is happy, knows his or her place, respects the authority that exists, is not envious of others, is cooperative and loyal to the organic whole, and is satisfied in the stability of the collective reality. It is easy to see why such an ideal has grabbed masses of insecure people throughout the ages. But, unfortunately, it has also spawned dictators who�lacking the humanity and wisdom of Plato�have submitted millions of people to fear, starvation, torture, and death. 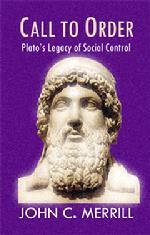 So Plato�s legacy of social control is a mixed one. It has provided stability and Order where they were needed. It has led to inhumane and unimaginable suffering where it was not needed. Plato�s concept of an ordered society is interesting to think about, like other utopias that beckon to us. But it should be a warning that order may very possibly lead to conformity, and conformity to the death of the individual soul. Society, through regimentation, may be prolonged, but it may be only a society of depersonalized robots. Marquette Books LLC is moving its production and distribution operations into a 1,400-square-foot office located in the Ben Burr Building in Spokane, Washington. "We've outgrown our current space and also need to hire more employees," said David Demers, publisher and owner of the company, which is one of America's fastest growing independent book publishing companies. The company has more than 60 titles in print and will publish another two dozen books and eight academic journals in the next year. In addition to book production, the new location will offer to the public discount printing and copying services and shipping supplies and services. The business is expected to open its doors to the public on Nov. 3. Fullerton Wins AWC's "Headliner Award"
Marquette Books author and advertising professor Jami Fullerton has been named the Headliner Award winner for 2007 by the Association for Women in Communications (AWC). The Headliner Award recognizes an AWC member who has recent national accomplishments as well as communications excellence. Fullerton will receive the award Oct. 6 at the AWC national conference in Orlando, Florida. Previous winners include TV show host Barbara Walters, former Washington Post Publisher Katherine Graham, former Associated Press Reporter Helen Thomas, and MSNBC TV news anchor and reporter Rita Crosby. 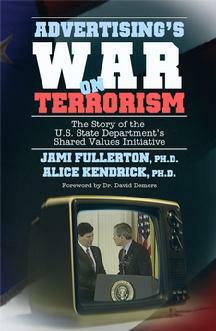 Fullerton is coauthor of Advertising�s War on Terrorism: The Story of the State Department�s Shared Values Initiative. Citing original research and internal documents, the book found that, contrary to news media and governmental reports, the State Department�s 2002 "Brand America" television advertising campaign fostered more positive attitudes toward the United States in some Middle Eastern countries. However, the campaign was ended after about two months. SPOKANE, WASH. -- Marquette Books, which published its first book in 2002, will publish its 50th title in fall 2006, making it the fastest growing small independent book publisher in the United States. The Spokane-based publisher also announced that it has incorporated as a Limited Liability Company (LLC). 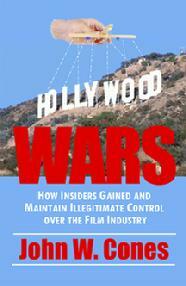 The 50th title is Hollywood Wars: How Insiders Gained and Maintain Illegitimate Control Over the Film Industry, written by Los Angeles independent film attorney John W. Cones. The book argues that the six big Hollywood film studios exercise so much control over the production and distribution of films that they restrict competition and violate anti-trust laws. The book cites hundreds of case studies, examples and anecdotes to document its accusations. "We are very pleased to reach the 50th-book milestone," said Dr. David Demers, founder and publisher of Marquette Books LLC. "We plan to add 50 more titles to our list and do it in less than two years this time." About half of the titles published by Marquette Books are written by professors of mass communication and journalism. They focus on mass media and mass communication processes and effects. The other half contains a mix of nonfiction and fiction on a variety of topics. The Bush Administration missed an opportunity to improve America’s image in the Arab and Muslim worlds when it shut down the controversial 2002 "Brand America" public diplomacy television advertising campaign, according to a new book written by two U.S. advertising professors. Contrary to reports from the news media and government at the time, the Shared Values Initiative (SVI)—the official name for the advertising campaign at the State Department—improved America’s image in Indonesia and possibly throughout the Middle East, according to Jami Fullerton of Oklahoma State University and Alice Kendrick of Southern Methodist University. "So, did SVI work?" the professors write in Advertising’s War on Terrorism: The Story of the U.S. State Department’s Shared Values Initiative. "According to internal State Department documents about SVI in Indonesia, the campaign achieved its objectives. It not only got people talking about Muslim life in America, it also produced more positive perceptions of America." 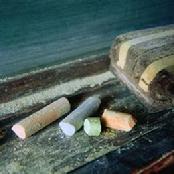 This finding also is backed up by experimental research the professors conducted in London, Cairo and Singapore. After viewing the five television advertisements, international students were more likely to believe Muslims are fairly treated in the United States and the students had more positive attitudes toward the "United States government" and "U.S. people." The research also found that attitudes toward the United States improved more among Muslim students than among Christians and other students. The goal of SVI was to convince the Muslim and Arab world that America wasn’t waging war on Islam. The Madison Avenue-produced ads depicted the happy lives of Muslims in America, including Dr. Elias Zerhouni, director of the National Institutes of Health, who is shown on the cover of the book shaking hands with President George W. Bush. The commercials aired in Indonesia and other Middle Eastern and Asian countries over a month-long period between late October and early December 2002. About 300 million Arabs and Muslims saw them. "Public diplomacy practitioners and scholars continue to lambaste SVI and the idea of using advertising as a weapon in the war on terrorism," they write in the final chapter to their book. "The official account is that SVI failed. ... However, research presented in ... this book suggests that SVI may have worked. ... So the question becomes: If communication campaigns like SVI have the potential to be effective, what went wrong in 2002 and what can be done in the future to make similar public diplomacy programs work better?" The authors place much of the blame on State Department bureaucrats and on journalists, who at the time of the campaign denounced SVI, saying it didn’t work. The bureaucrats and journalists also criticized SVI’s creator, Charlotte Beers, a former advertising executive who created and directed the SVI campaign when she was under secretary of public diplomacy and public affairs at the State Department. Some State Department bureaucrats belittled the creator of SVI (Beers) simply because she was an "outsider" who had new and different ideas. Many State Department bureaucrats have little knowledge about mass communication research and theories, even though they supposedly are in the business of promoting America’s image to the world. Some State Department bureaucrats refused requests from the authors for basic public information about the Shared Values Initiative. They cited the Smith-Mundt Act to defend their actions, but they have provided no good evidence to justify this position. The decision to deny access appears to be motivated by a desire to suppress information that could embarrass State Department officials. The book offers some praise for former Secretary of State Colin L. Powell, who initiated the "Brand America" campaign. Powell defended Beers but this apparently did not convince many State Department bureaucrats to support Beers or the SVI campaign. "Every once in a while a book comes along that provides an ‘ah ha, so that’s what happened!’" said Dr. Richard Nelson, professor of mass communication at Louisiana State University and author of A Chronology and Glossary of Propaganda in the United States. "Advertising’s War on Terrorism does that for the question of why ... the United States ... is having trouble winning hearts and minds overseas. ... [This] book should be read by every member of Congress and every State Department employee." Simon Anholt, public diplomacy adviser to the United Kingdom and author of Brand America, said the Advertising’s War on Terrorism book "is a competent and detailed counter-argument in support of the mature, intelligent and relevant use of marketing communications in foreign policy." Dr. Nancy Snow, a former State Department diplomat and now a senior fellow at the University of Southern California Center on Public Diplomacy, said "professors Fullerton and Kendrick are to be saluted for their efforts to deconstruct advertising’s potential—and limitation—in political communication. Excellent case study for students interested in the post-9/11 environment, where marketing, national image, and winning hearts and minds come together." Although the findings suggest that advertising is an effective weapon in the war against terrorism, the authors aren’t prepared to advocate that yet, but they point out that it is premature to dismiss advertising as tool of international diplomacy. They recommend further research and strongly recommend that the State Department hire diplomats who understand mass communication theories and research. Jami Fullerton (Ph.D. University of North Texas) is an associate professor at Oklahoma State University, where she teaches advertising and mass communication research and theory. Dr. Fullerton, who is the recipient of one State Department grant and a participant in two others, often spends her summers abroad teaching and conducting research on cross-cultural communication and media globalization. The OSU College of Arts and Sciences named her an outstanding researcher in 2001. She currently serves as chair of the American Advertising Federation’s Academic Committee and the AAF Board of Directors. 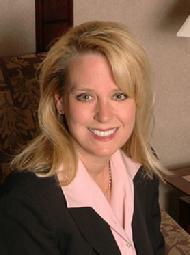 Alice Kendrick (Ph.D. University of Tennessee) is a professor in the Temerlin Advertising Institute at Southern Methodist University. She has published more than 30 refereed research papers, numerous industry reports, and Successful Advertising Research Methods (with Jack Haskins). She has served on the National Advertising Review Board, the American Academy of Advertising’s research committee, and the boards of the American Advertising Federation and Dallas Ad League. *This book is available directly from the publisher (call, fax or e-mail for information on volume discounts) or through Baker & Taylor, YBP, Blackwell’s, Coutts or any other national book wholesaler. Marquette Books of Spokane, Washington, has announced that it will partner with Xerox, ExactBindWest and other hardware and software companies to offer a complete book publishing system for less than $10,000. "Book publishers can fire their printers," says Dr. David Demers, owner and publisher of Marquette Books. "This system produces high-quality perfect-bound books with four-color covers for as little as $1 a copy. All you need is a computer." Dr. Demers, who works full time as a college professor, spent the last four years perfecting what he calls the "No Risk Book Publishing System" (trademark pending). Since then, he has published more than 30 titles and sold more than 11,000 books—all in his spare time. "It took a long time to find the right equipment and papers to do the job right," he says. "But this system works, and all of the components can be purchased for less than $10,000 in toto. You don’t have to spend $50,000 or more on a fancy digital book publishing system." The system includes a perfect-binding machine, a creaser, a cover laminator, a high-speed inkjet cover printer, and a black-and-white laser printer (for the text). The No Risk Book Publishing System is perfect for the small publishing company that produces fewer than 25 titles a year, he said. "Even if you only publish two titles a year, the system can pay for itself in two years," he says. "For print runs of fewer than 1,500 books, the No Risk Book Publishing System is generally less costly than hiring a conventional printer. If you need more than 1,500 copies, then a conventional printer is the way to go. But be certain you will sell those copies. If there is any doubt, then the No Risk Book Publishing System is a much smarter choice." Dr. Demers said his company began turning a small profit in its second year and has been profitable every year since. The No Risk Publishing System has enabled Marquette Books to become one of the fastest-growing small book publishing companies in the United States. The company specializes in academic books on mass communication but also has a wide variety of other nonfiction and fiction titles. Dr. Demers is a mass media professor at a major research university in Washington state. "What I like about the No Risk Book Publishing System is that you can experiment in different kinds of publishing genres and not lose your shirt if a book flops," he said. Dr. Demers said he’ll reveal the secrets of the No Risk Book Publishing System to anyone who calls. "I just ask that Marquette Books be given an opportunity to bid on the products you purchase," he says. "I buy at wholesale and I’ll also give you free technical advice for as long as you own the products." Dr. Demers can be reached at 509-443-7057 or . Additional information about the No Risk Book Publishing System can be found at . Two Spokane book authors will host separate mini-seminars on sleep disorders and on the Anasazi Culture at Auntie�s Bookstore in downtown Spokane at 7:30 p.m., Thursday, June 23. Ray Edwards will talk about a rare sleep disorder in which victims are unable to sleep. Edwards became an authority on the topic after conducting research for his new novel, Justice Never Sleeps: A Novel of Murder and Revenge in Spokane. The main character in his book, Quinn Black, is unable to sleep after being shot in the head. Dan Robison will talk about the Anasazi Indians, who lived in the Southwest from about 300 B.C. to A.D. 1350. Robison is an authority on Native American and Hawaiian cultures. His new novel is called Wind Seer: One Native American Boy�s Contribution to the Anasazi Culture. The main character is Crow, a 13-year-old Pueblo Indian boy who undertakes a quest to save his community. Both books are published by Marquette Books of Spokane. The authors will answer questions and sign their books after the short seminars. Harriett Holmes was 15 and pregnant when in 1837 she boarded a Kentucky shantyboat that would become her home for the next decade. Life was difficult for many people during the 1800s, but it was especially so for Harriett’s family, because they were Melungeons, a mixed race with low social status. Racial discrimination is one of the key themes of The Drifters, a new book that follows Harriett and her family through the Trail of Tears, the Civil War and Texas cattle drives. Redemption is another theme. Can a slave help Harriett and her family find solace, redemption and grace through God? The Drifters: A Christian Historical Novel about the Melungeon Shantyboat People is the first novel to feature the Melungeon shantyboat people, a nearly forgotten ethnic group in American history. Tonya Holmes Shook of Hastings, Oklahoma, spent eighteen years researching and writing the book. 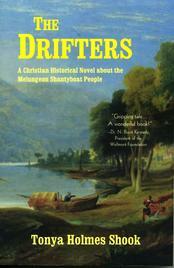 "The Drifters is a powerful book exploring the gamut of human emotions during the American Civil War and the Indian War years," says Dr. N. Brent Kennedy, author of Melungeon, The Resurrection of a Proud People: An Untold Story of Ethnic Cleansing in America and president of the Wellmont Foundation in Kingsport, Tennessee. "Tonya’s gripping tale ... spills over to questions of race, ethnicity, and social class, and how these factors interact with the broader issues of right and wrong, good and evil. But perhaps most touchingly ... The Drifters rides a theme of unrequited love, in this case a devotion that was not diminished by death nor the passing of time. A wonderful book!" The Drifters is loosely based on the lives of Tonya’s 19th century relatives. experienced heartaches relating to her sons William and Jasper, and relocated after the war to Texas, where some of her sons participated in cattle drives." Tonya said she wrote the book partly because she had "a deep-seated passion to give a sensitive voice to those lost and forgotten people." She said she hopes readers will "gain new insight into the diversity of American culture" by uncovering the "hidden shame" associated with the persecution of the Melungeon people. "This book grips your interest from start to finish, especially as you learn about the ability of these people to survive in spite of the utter disdain in which they were held while living in shantyboats on some of our nation’s major rivers," says Jo Ann Rowan of Gray, Tennessee. The Drifters is 312 pages, includes eight pictures of Tonya’s 19th century relatives, and has a retail price of $19.95. Inquiries about book orders should be directed to Marquette Books. Tonya Holmes Shook was born in Oklahoma and lived in New Mexico and Texas before returning to Oklahoma in 1985. She is author of Displaced Cherokee: Come Home, Come Home, a book documentary that took First Place in the 1986 Open Class Category at the Oklahoma State Fair. The book also was endorsed by the Oklahoma Department of Libraries. In addition to writing books, Tonya is an accomplished artist, poet and short story writer. Many of her works have Christian themes. Tonya is available for media interviews and book signing. She can be reached at shookum@pldi.net or 580-439-6912. Marquette Books of Spokane, Washington, is soliciting book manuscripts that focus on events or places in Spokane or the Inland Northwest. Submissions may be either nonfiction or fiction. Manuscripts that deal with the history of Spokane and its residents are especially encouraged. Prospective authors should submit a brief prospectus (for guidance, see our Website www.MarquetteBooks.org; and click on "Need a Publisher") and a sample chapter of the manuscript to Marquette Books, 3107 E. 62nd Ave., Spokane, WA 99223. Inquiries are welcome at books@marquettebooks.org or 509-443-7057. Middle East and U.S. news media coverage of the 2003 Iraq War was extremely biased, according to a new book edited by a former U.S. journalist who is now a scholar at The American University in Cairo, Egypt. "The Middle East media were unrelenting in their pre-war, wartime, and post-war criticism of the United States and ... the Blair government in the United Kingdom," writes Ralph D. Berenger, a journalism and mass communication professor who edited Global Media Go to War, a collection of 34 essays and studies about the role of news and entertainment media during the 2003 Iraq War. "In fact, regular readers of the Arab press are hard-pressed to recall any favorable stories about the United States over the past decade, including perfunctory, carefully parsed, and brief sentiments following 9/11." But "the West, too, conducted a rigorous propaganda campaign to drum up support for war against Iraq among wobbly-kneed allies," Berenger adds in the "Introduction" to the book. "The propaganda machine ground out stories, real and speculative, of Saddam Hussein’s intentions in the region, his financial support of suicide bombers’ families in Palestine, his continued threats against Iraqi Kurds and Shia’as, his regime’s alleged links to al-Qaeda cells and training centers in Iraq, his family’s personal extravagance ... and, most importantly, his acquisition of weapons of mass destruction and his willingness to use them against enemies foreign and domestic." in the world, including Cees J. Hamelink of the University of Amsterdam, Kaarle Nordenstreng of the University of Tampere, and John C. Merrill of the University of Missouri—criticize Western news media such as ABC, British Broadcasting Corporation, CNN, The New York Times, and Fox News Network for their pro-Western bias. 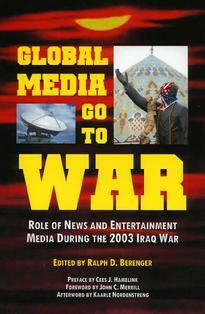 The chapters point out that during the war, television viewers in Western countries saw mostly scenes of U.S. and coalition soldiers fighting their way to Baghdad. In contrast, viewers in the Middle East, who depended heavily on satellite coverage from Middle East television news organizations like Al-Jazeera, saw scenes of injured or killed Iraqi civilians. These two radically different versions of the war stem partly from the fact that media on both sides depended more heavily on their own political and military elites for the news. In fact, Professor Beverly Horvit of Texas Christian University (Chapter 6) found that Western news agencies quoted Western news sources twice as often as non-Western sources; conversely, non-Western news agencies quoted non-Western sources more often. "The book provides strong support for media system theory," said David Demers, an associate professor of communication at Washington State University who helped edit and publish the book. "Mainstream news media in the United States and other Western countries depend heavily on powerful Western political and military elites for the news, and those elites frame events to suit their own political and military objectives. Coverage of the 2003 Iraq War on both sides was extremely parochial. The media served their own masters." Ralph D. Berenger (Doctor of Arts, Idaho State University) is an assistant professor of journalism and mass communication at The American University in Cairo, Egypt, where he teaches courses in international communication, ethics, media management and communication theory. Dr. Berenger has published dozens of scholarly articles and has more than 30 years of professional experience as a newspaper and magazine reporter, editor, publisher and international consultant.